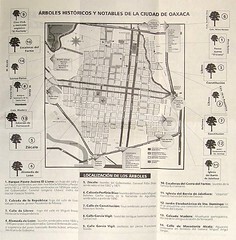 Oaxaca City (Oaxaca de Juárez) is a fine place. Keep an eye on the weather! The city is located in the Central Valley of the Sierra Madre del Sur Mountains, at 17°05'N 96°45"W, elevation: 1,550 meters or 5,000 feet. While tourism campaigns have long touted 'destinations' -- we are simply entering a place that is someone else's home. 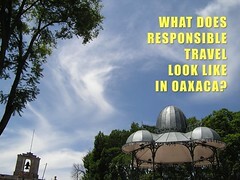 What is responsible travel?Here's our thought: responsible tourism is treating others the way they wish to be treated. It's a variation on the Platinum Rule ... it's also common sense and good manners. Or put another way - courtesy of the 2002 Cape Town Declaration on Responsible Tourism -- responsible tourism creates better places for people to live and better places to visit. Two branches of the Sierra Madre Occidental converge in the center of the state of Oaxaca, creating this fertile valley, which produces a variety of crops including corn, alfalfa and the maguey used to make mezcal. Oaxaca's pleasant subtropical climate drew nomadic families to Mitla and nearby caves 10,000 years ago. Farming communities evolved in Abasolo, Tomaltepec, and El Mogote. The Zapotec kingdom Monte Albán emerged in 500 B.C. Oaxaca is one the most exceptional regions of the world. Its cultural and environmental diversity, its role in art and artesania make the state an exceptional place to spend quality time. UNESCO declared the city a World Heritage Site. Holy Week (Semana Santa) is treated with great reverence. A great time to visit Oaxaca City is during the summer rainy season, when the surrounding cornfields are green. Bring an umbrella! The Guelaguetza dance is performed and the baseball season is in full stride. Day of the Dead is one of the biggest holidays of the year. Christmas season is a joy. On the night of December 23, a long line of visitors spirals around the Zócalo to witness the Radish Night (Noche de Rábanos). People come from near and far to admire the fantastic carvings. Try the local comida, which includes chocolate, corn and grasshoppers. There are numerous gardens, plazas and parks. 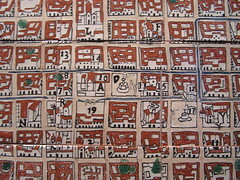 Oaxaca's name comes from a mangled version of the Aztec settlement Huaxyacac ("place of gourds"). Occupying the area as early as 1521, the Spanish established their new settlement in 1529. Oaxaca was first called Antequera after a city in Spain, and this early name is given to numerous businesses. Antequera was re-christened Oaxaca on April 25, 1532, and the city quickly became one of the most important agricultural and trading centers in the region. It is formally known as Oaxaca de Juárez. The city is affectionately known as La Verde Antequera. Tip: Mark your calendar. The city celebrates its 500th anniversary in 2032. There are plenty of entertainment options, including live music. For those with simply a thirst, consult our list of pubs and cantinas. LOCATION -- Oaxaca City is south of Mexico City and east of Huatulco, Puerto Angel and Puerto Escondido. TRANSPORTATION -- Whether you arriving by plane, bus, bike or automobile, consult our transportation guide. INFORMATION -- If you need tips on tourism offices, book stores, libraries, banks and post offices, consult our information guide. TIP -- Bring your umbrella (brolly) during the summer rainy season (May-September). WORLD TRAVEL DIRECTORY - Oaxaca City is home to Bicicletas Pedro Martinez, winner of the Colibri Ecotourism Award. SPANISH LANGUAGE SCHOOLS - Oaxaca City is home to a number of language schools: Amigos del Sol, Instituto Cultural Oaxaca, Becari and Solexico.